We have to hand it General Motors, the American automaker is not afraid to dream big when it comes to the cars of tomorrow. Back in December 2011 we had a chance to make the trip out to Detroit and check out GM’s EN-V electric pod car-of-the-future for ourselves. Needless to say we came away impressed, even if we were left a little less than optimistic we would ever seen one make the jump from functioning prototype to production model. Recently, however, at the Beijing Motor Show, GM was on hand to show off a rendering of the next-generation of the self-driving car – and guess what? It’s wearing a bowtie. 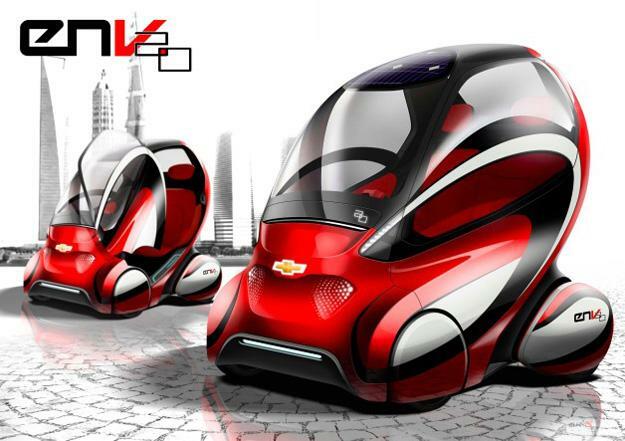 Branded with the iconic Chevrolet bowtie, the EN-V 2.0 “Mobility Concept Vehicle” will see the addition of two more wheels, bringing the total to four and preventing it from appearing a little less out-of-this-world than it already does. The EN-V 2.0 is also set to feature more traditional vehicular amenities including in-vehicle climate control and larger personal storage space along with its fancy new digs. GM also notes that the autonomous pod car will even be able to brave the elements and drive in all-weather and city road conditions. However, one aspect that looks to go unaltered since the tiny pod car’s debut at the 2010 World Expo in Shanghai is the electric motor — the latest EN-V is slated to retain the same EV powertrain with a similar 25-mile range featured in the initial concept. With the original EN-V, and the planned 2.0 model, GM says it aiming to pioneer new automotive DNA based on the convergence of electrification and connectivity. What that essentially translates to are autonomous and “connected” vehicles where passengers and drivers –although drivers doesn’t seem all too appropriate here — will have access to wireless communications, including social networking via internet connectivity and telematics, all while on the go without having to actually “drive” the car. According to GM, the EN-V 2.0 could be available by 2020, but extensive pilot studies will be conducted in China prior to that. Of course it’ going to be a long road before fully autonomous vehicles like the EN-V are buzzing about your local roadways, but GM remains dedicated nonetheless. And while semi-autonomous features appear poised to make their way slowly into the luxury segment of GM’s fleet before the end of the decade (a prime example being future Cadillac models), fully autonomous vehicles will likely be further off. Still, the EN-V is certainly an ambitious endeavor being undertaken by GM. We only hope it won’t be too long before we actually get to enjoy the next big step in automotive evolution. Is Spotify secretly creating a Pandora radio clone?